Please link to, use to educate and Share! 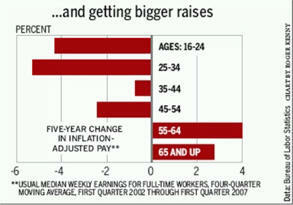 Is Making $57,734 Middle Class? See Why is Poverty So Controversial? Editor's Note: Data Collection Method is important. Inexpensive live better products from East Asia. Government imposed Real Estate/Building Industry standards. Neither are measured properly by economists and politicians. The Congressional Budget Committee should be charged with gathering unbiased economic statistics affecting wellbeing. 1. Purchase of Necessities Proceeds Savings. 2. 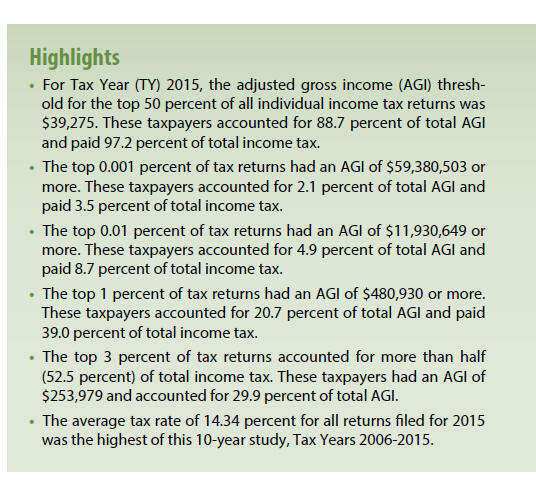 Increased Payroll Taxes and Insurance Cost Left Less for Savings. 4. In a Flat World Top Gets Income from Many More Places. 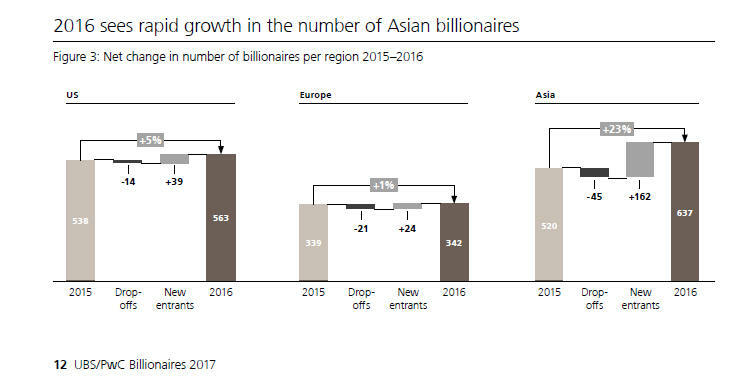 Wealth of Everyone Going Up at Reasonable Rate? a. Political, economic and scientific advancement consistency. b. In the West wellbeing is up dramatically. 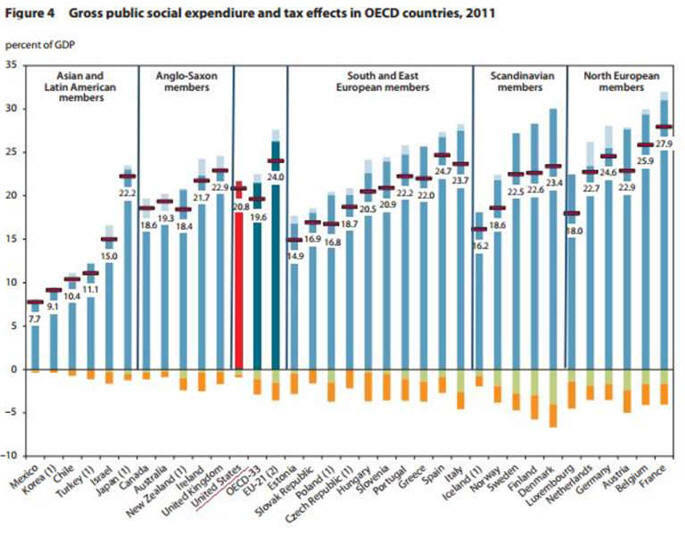 c. In Japan and South Korea, wellbeing is up consistently. d. In China wellbeing is up recently. Putin has restored much deserve dignity and related wellbeing. People's Budget of UK in 1911 started the redistribution process. 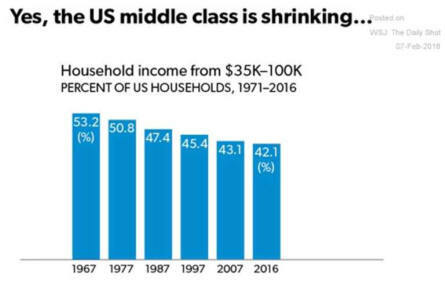 Middle Class Squeeze Continues from The Big Picture Blog. 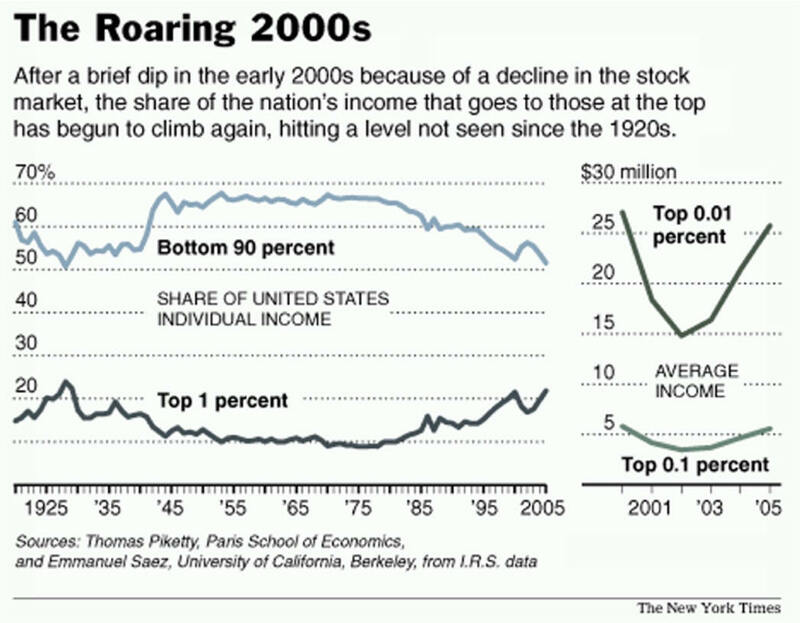 despite a sharp upswing in income inequality. D. Top Getting too much? Is Liberal Democracy in Peril? WW 2 generated savings, pent-up demand and few foreign few competitors generated 25 years of high profits higher wages and cooperative unions. Oil Embargos and Competition Began early 1970's Wage Stagnation Japan's competitive manufacturing sector increased competition which caused stagnate Rust Belt wages and employment plus it put pressure on profit. 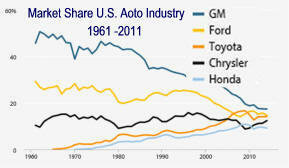 Japan manufacturers got lucky when gas efficient small green cars required a change in the U.S. manufacturing process. Detroit responded by protecting profits with less product quality improving capital investment. Unions leaders protect their positions and current worker wages by accepting a two-tier wage system. 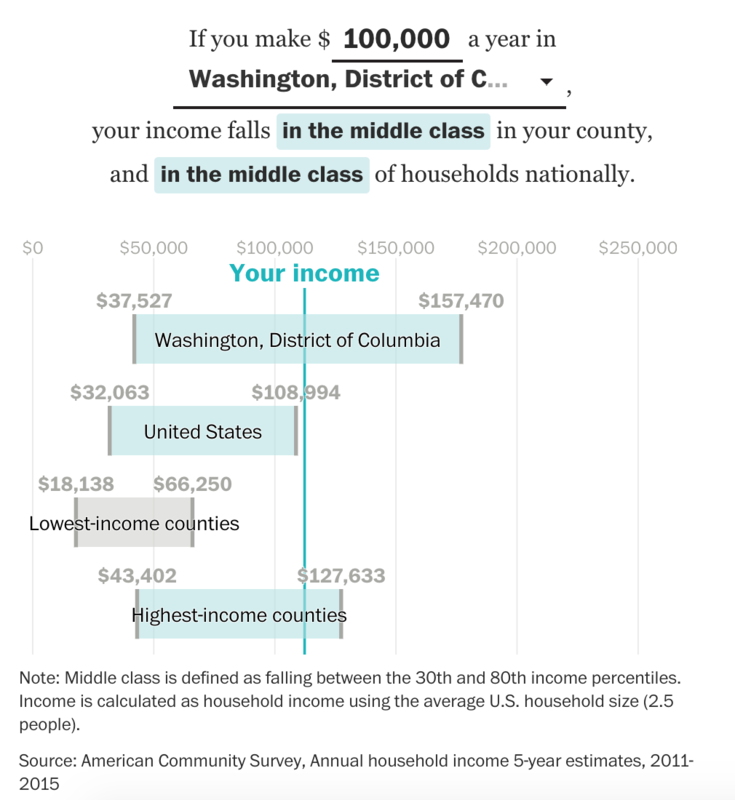 Is One Person Making $57,734 Middle Class? 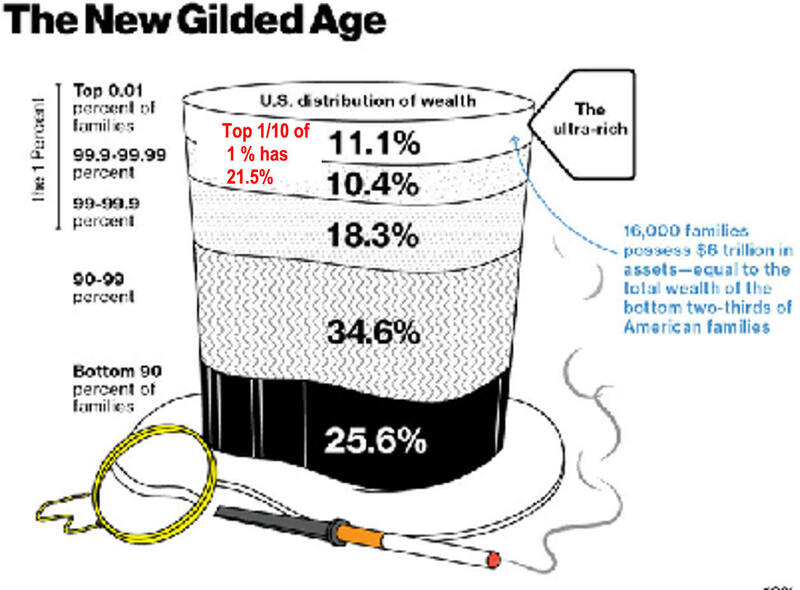 Are Their Upper Middle Class Limits of $100,000 to $349,000 Too High? Too Low? as 99% of the population receive no income. total equality and a value of 1 maximal inequality. health science, ecology, chemistry and engineering. growth model is a mathematics look by the FED. 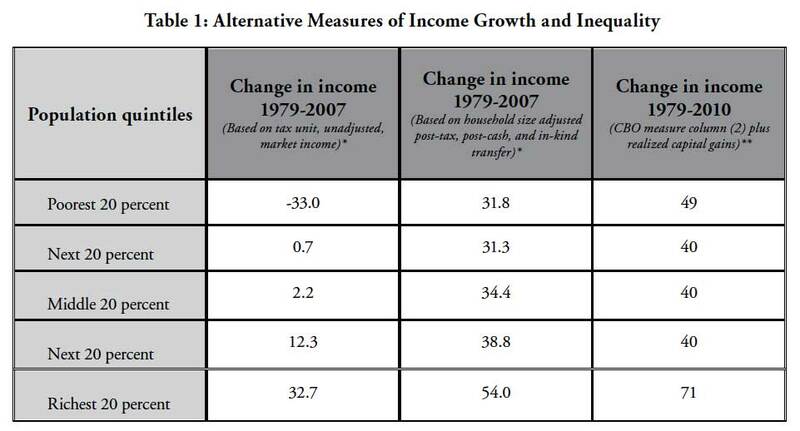 Timothy Noah points to a study that shows Americans underestimate income inequality. 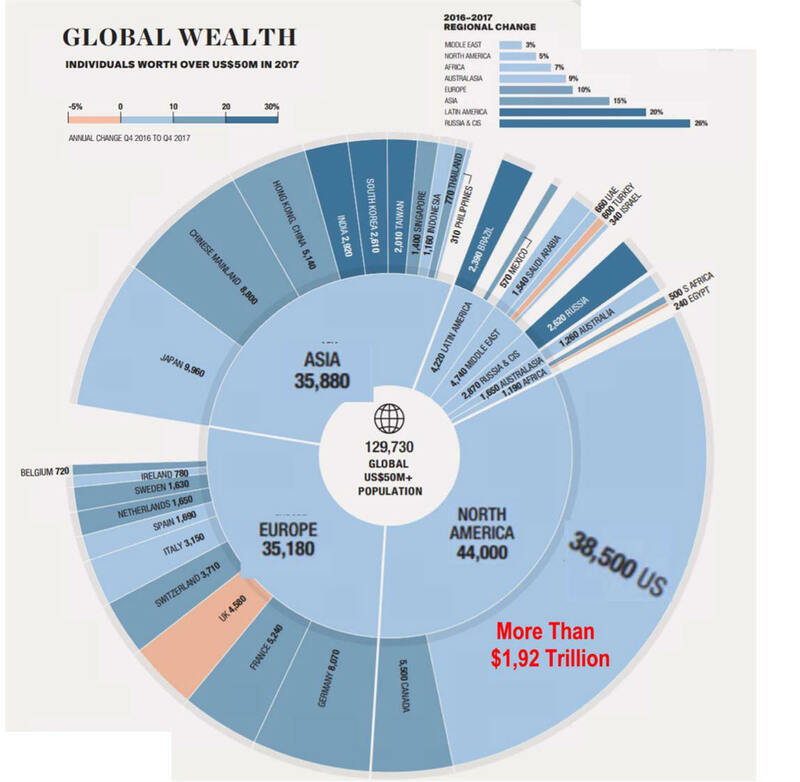 �The richest 1 percent account for 35 percent of the nation�s net worth; subtract housing, and their share rises to 43 percent. 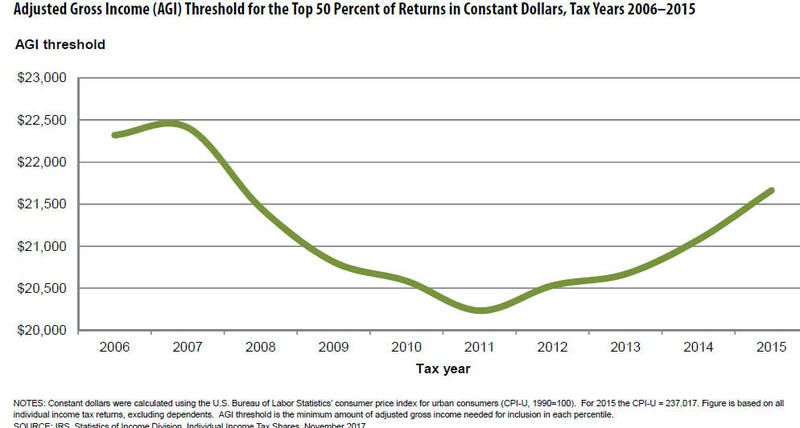 The richest 20 percent (or �top quintile�) account for 85 percent; subtract housing and their share rises to 93 percent. 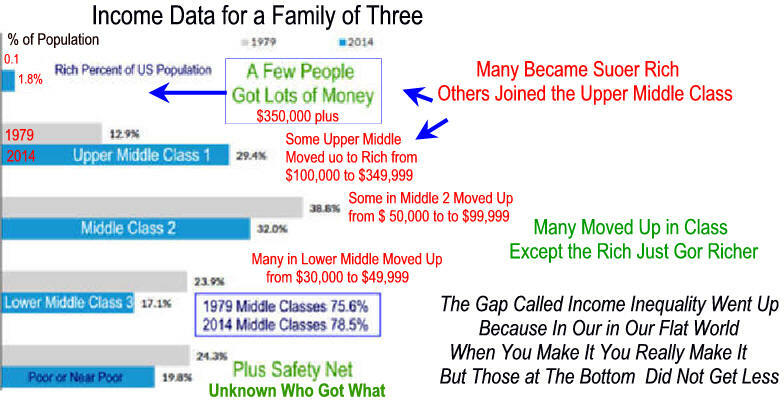 But when Norton and Ariely surveyed a group whose incomes, voting patterns, and geographic distribution approximated that of U.S. population, the respondents guessed that the top quintile accounted for only 59 percent of the nation�s wealth� Norton and Ariely also asked respondents what they thought the ideal distribution of wealth should be, and found, again, little difference among income groups, or between Bush voters and Kerry voters. 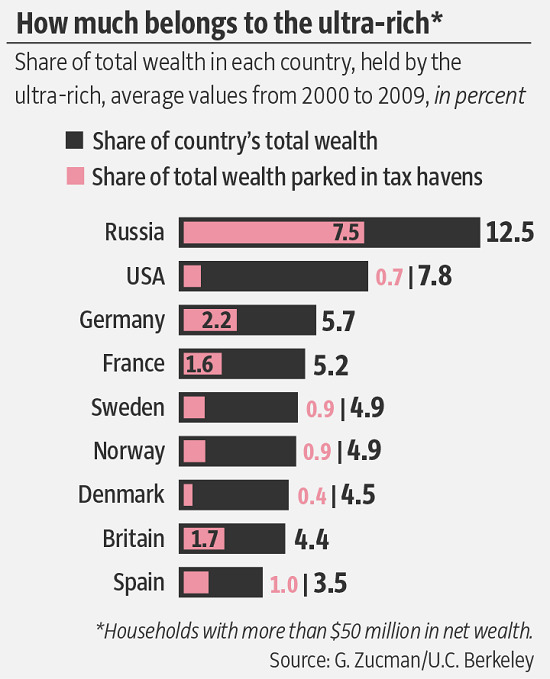 Most favored a wealth distribution resembling that in � Sweden! 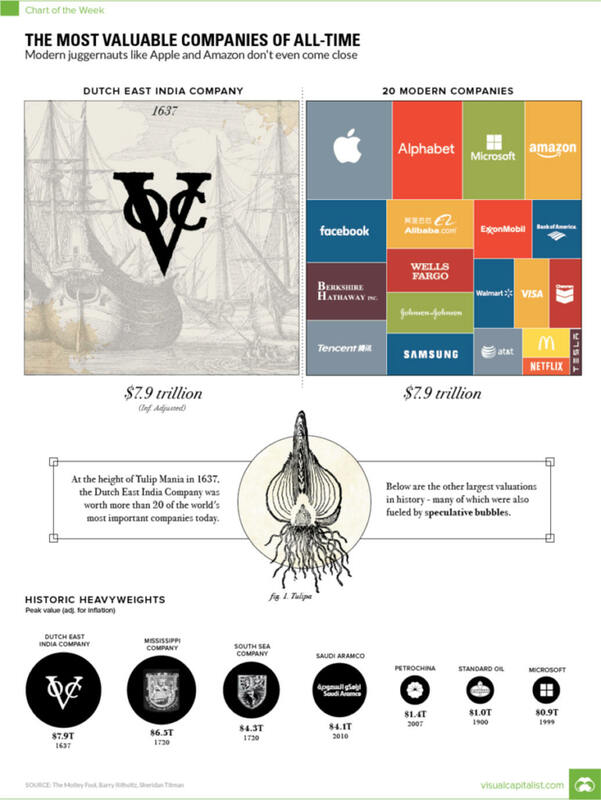 But when you examine Norton and Ariely�s method, that particular finding gets a little shaky. They showed respondents three unlabeled pie charts. One depicted utopian equality, with wealth distributed equally among five groups. he didn't get his first new car until 1947. 2. Equality Denial takes a different view. 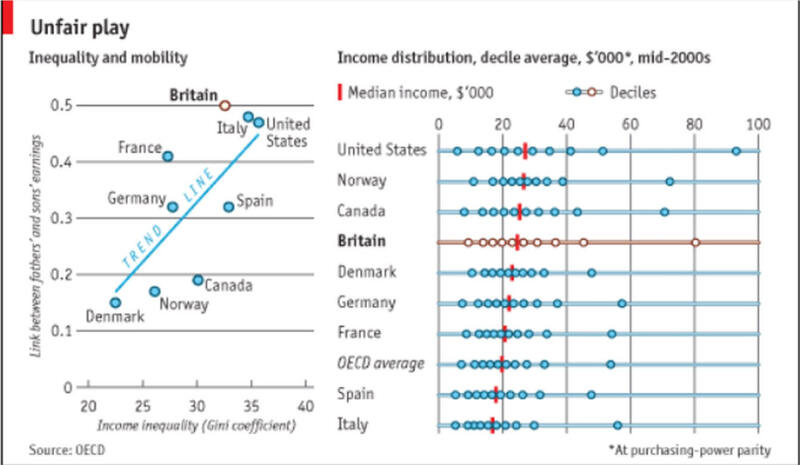 studies income distribution of many countries. 6. 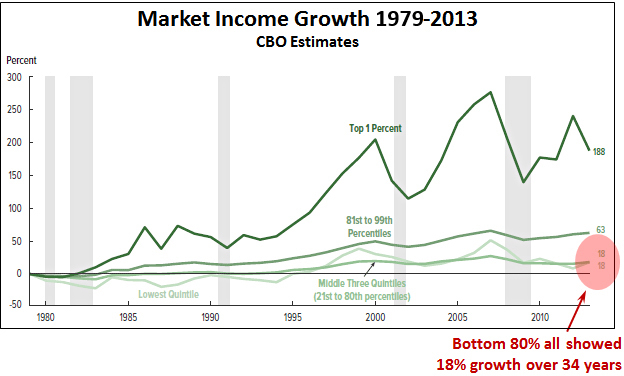 Inequality and economic policy is extensive. 1. 32.0% of the population lived in poverty in 1950. 2. Just over 11% was the poverty rate during the early 70's. 3. 15.2% of population during 81-82 recession which i poverty rate peak. 4. 14.2% of the population (35.7 million people) in 1991 lived in poverty. Hispanic children being 10.5% to 15.1%, 41.5% to 44.2%, NA to 33.9% respectively. 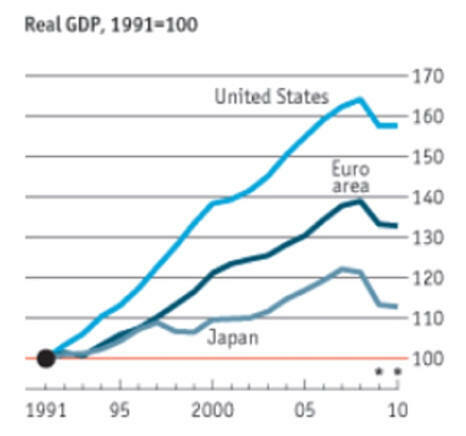 D. The Great Recession has poverty on the increase but government programs helped. 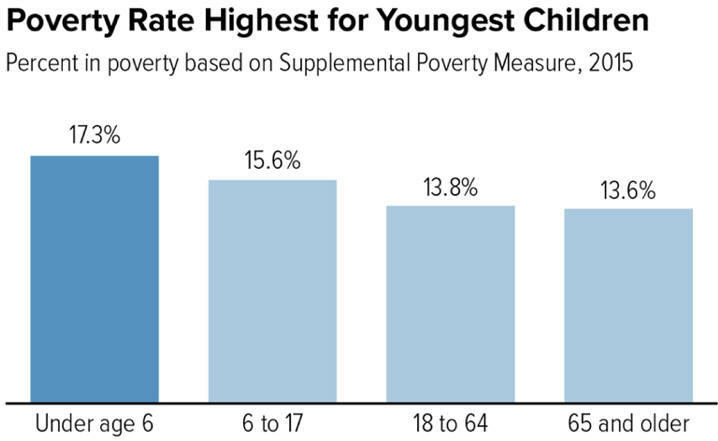 E. Poverty Thresholds are used to define Poverty and to determine program eligibility.
" The Census released a comprehensive report on poverty, income and health insurance coverage in the United States for 2010. There were 46.18 million people living in poverty, in the United States. The Census population for 2010 was 305,688,000. This means that 15.1% of people in the United States are below the poverty thresholds, or one in 6.6 people. 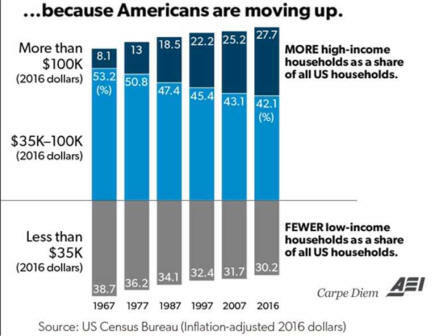 Note: The ratio of nonwhite to white median family income while improving some in the 1960's, is back to approximately the .55 level it was in the early 1950's. 1992 and 2003 Statistical Abstract of the United States and 2001 Census Bureau Data Update from Institute for Research on Poverty: "In 2001 the number of poor and the poverty rate both rose as economic difficulties moved into recession, and the rate has continued to rise; in 2003, 35.8 million people were poor by the official measure of poverty. 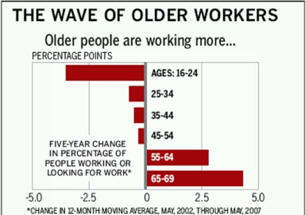 In 2004, the number rose to 37 million people (12.7 percent of the population)." 4. Why is Poverty Controversial? 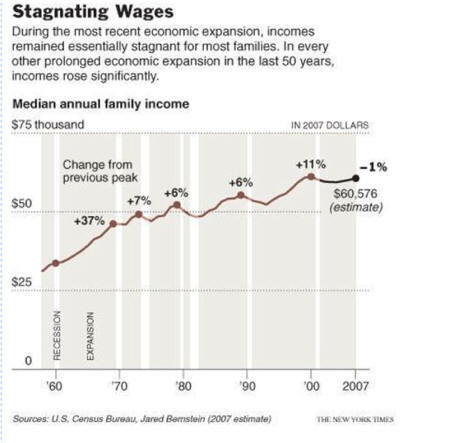 Because households can be one person and families can have two workers, this households declined much more than the family stagnation. 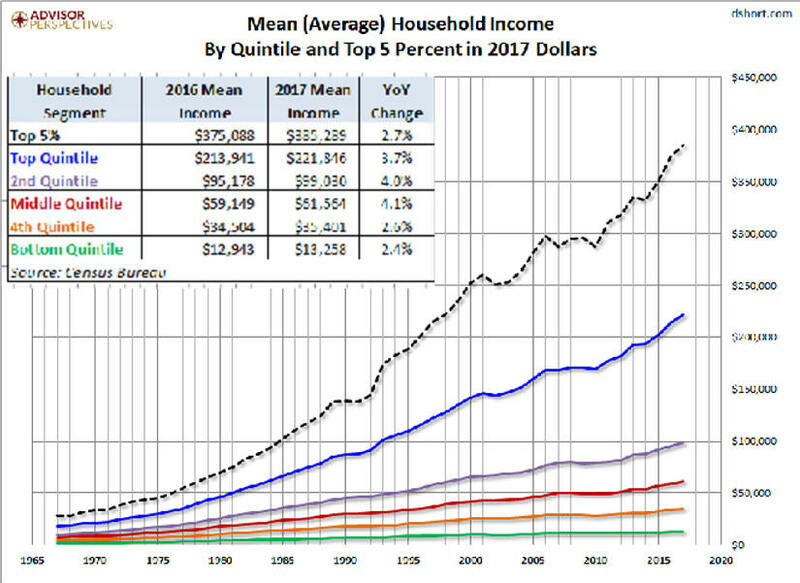 Because the US median income so high and because the official poverty rate in the U.S. excludes non-cash transfers like Food Stamps and School Lunch Help I'm not to sure this is a good analysis. The Real Problem is there are few good jobs and education won't help. 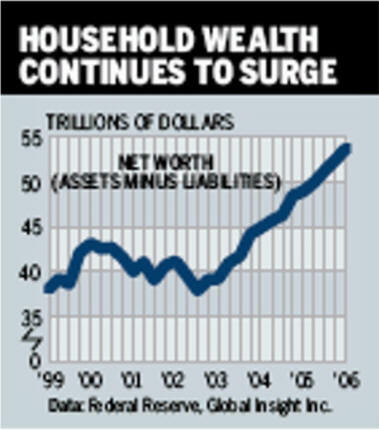 The recovery of the stock market after 9/11 and the most recent housing boom has household wealth up 40%. 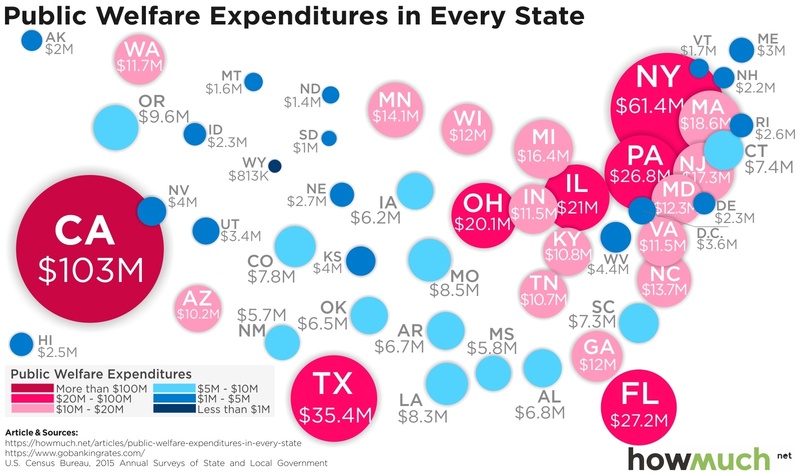 Editor's Note: This shoes how true data can misrepresent reality. 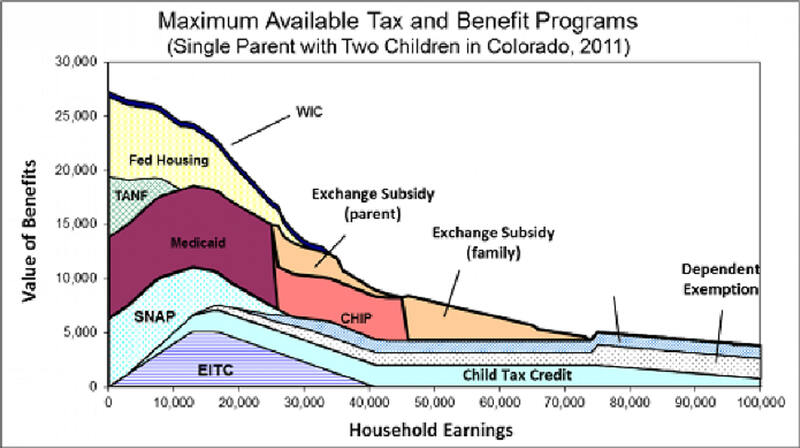 Note: Most poverty programs have a finite qualifying amount. 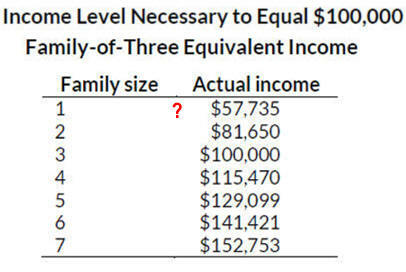 A family receiving substantial aid that is not counted as income may just qualify for aid while another family may earn just above the qualifying amount and receive no aid. 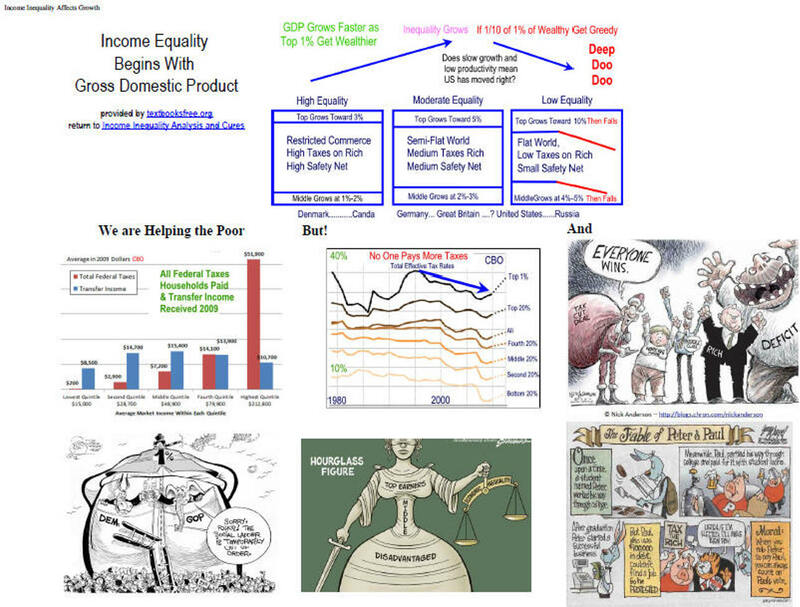 * Philip Armour, Richard V. Burkhauser, and Jeff Larrimore, �Deconstructing Income and Income Inequality Measures: A Crosswalk from Market Income to Comprehensive Income� American Economic Review (May, 2013). 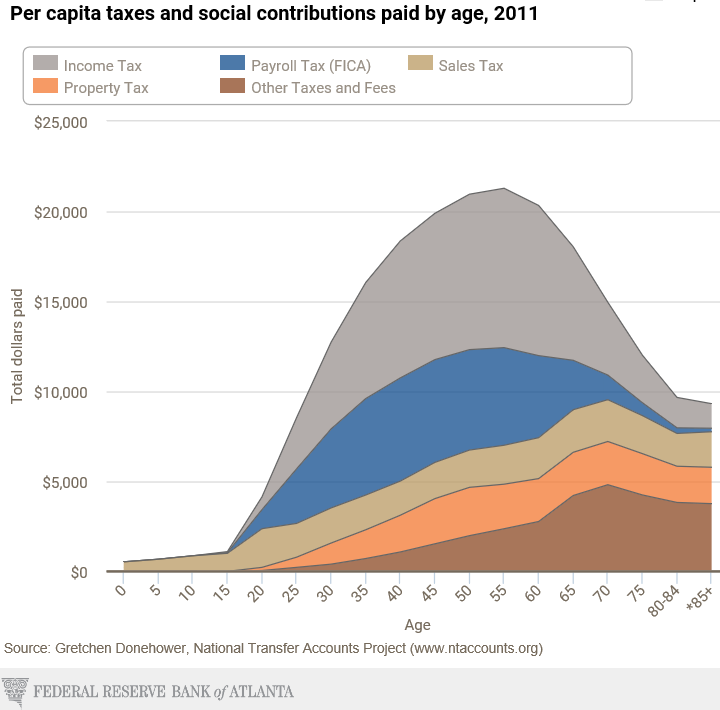 ** Congressional Budget Office, �The Distribution of Household Income and Federal Taxes, 2010� (Government Printing Office, 2013). 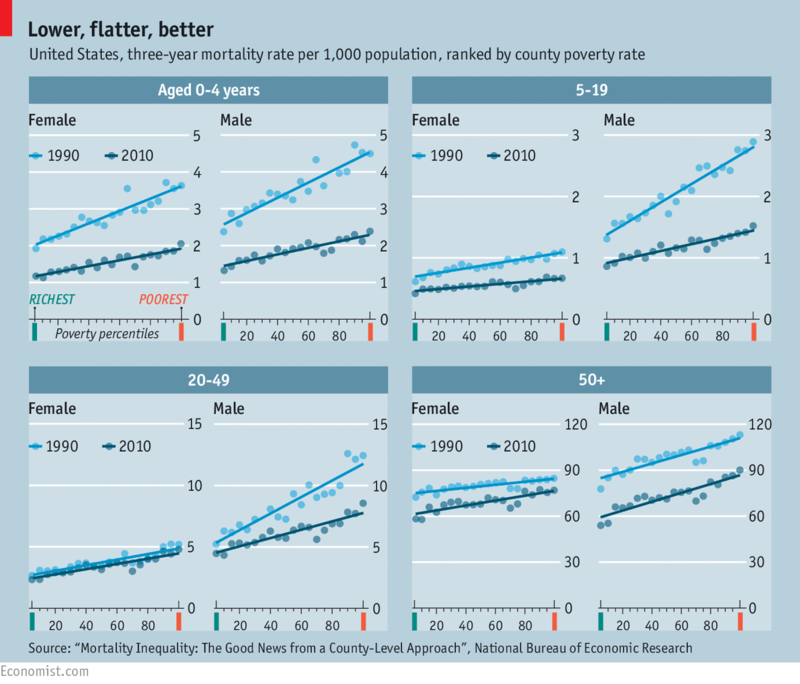 that America's poor are not that poor. Editors Note: Countries at top are dropping fast. VIII. Market Income is Not an Appropriate Measure of Well-being. elimination of a peacetime draft. 1. Conservative Is "Income Stagnation" a Myth? while sexual abuse dropped 64%. 1. 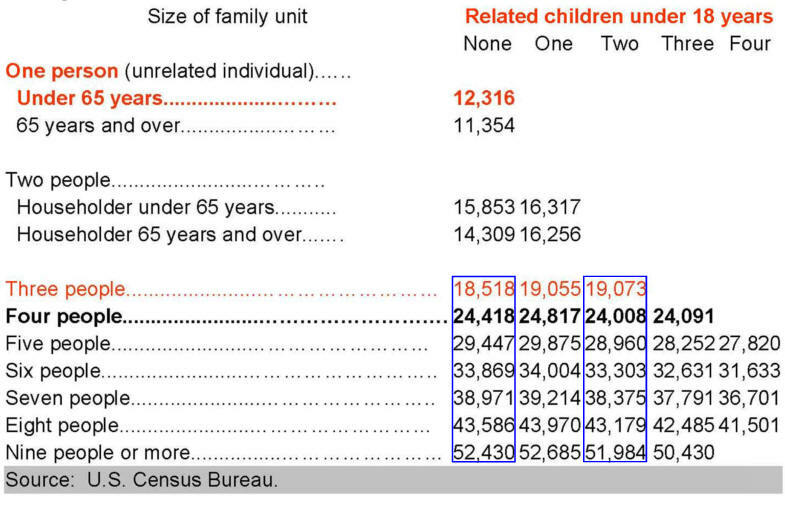 Income - Home for census bureau data and reports. 9. 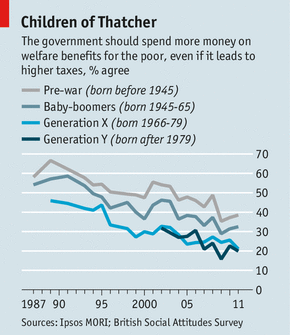 Second opinion of economic well-being of America's middle class. 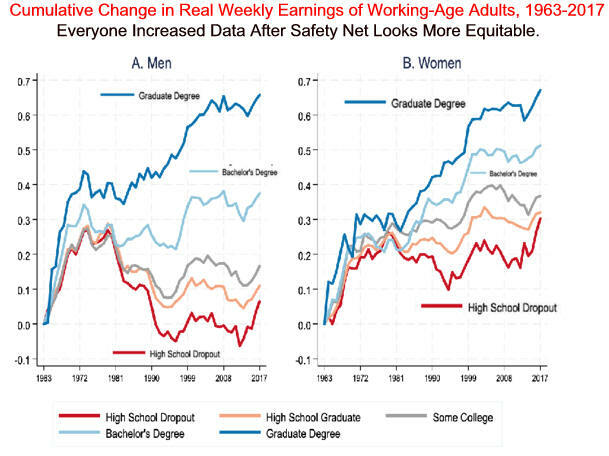 The Myth of Increasing Income Inequality by Diana Furchtgott-Roth). Author's editorial! from when he started this project. 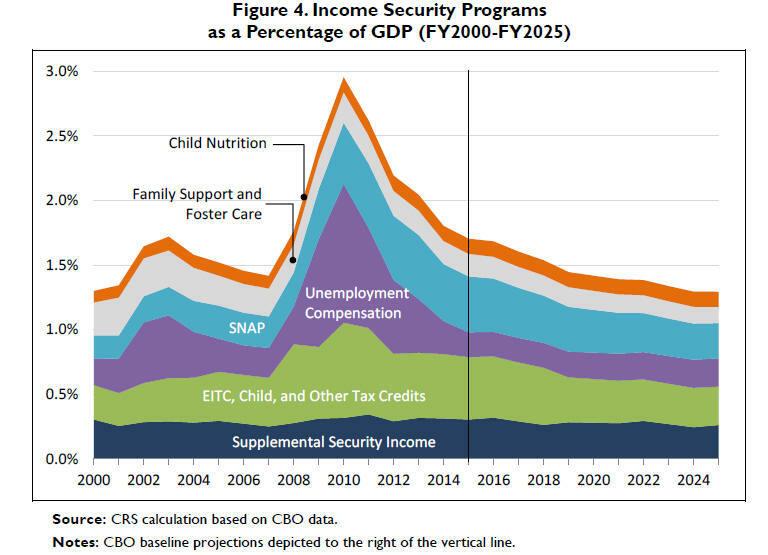 "Out of a total of $184 billion in welfare spending..."
"...Census counted only $32.5 billion as income." 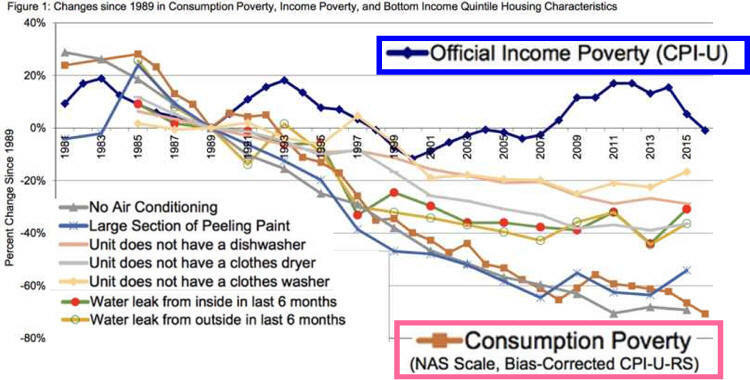 This means that the actual income of those living in poverty is substantially understated. if much of the money given them does not count as income! per person was not given in direct aid. 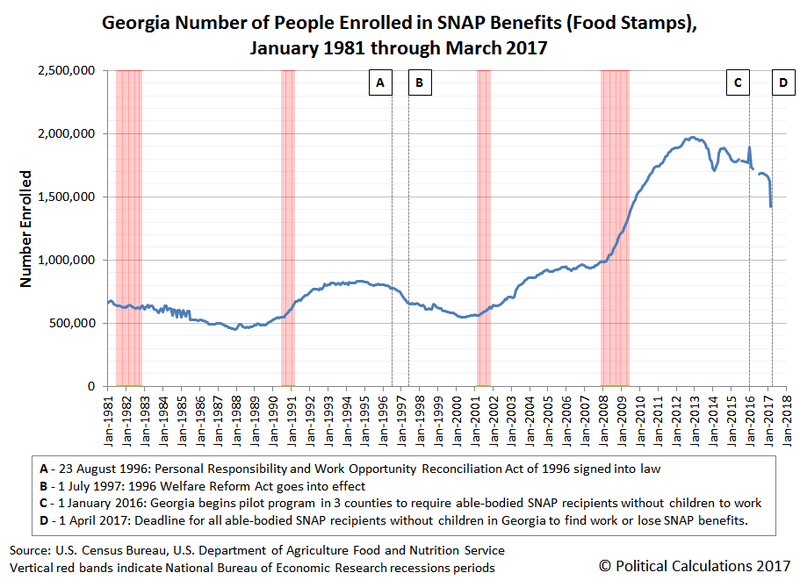 that the U.S. Government publish poverty rate is before noncash transfers like SNAP (food stamps). One Columnist used the rate during the Great Recession to report 50 million mostly children were starving. "Stupid is as stupid does." Top quintile share fell from 57.7% to 39.3%. B. Growth is Still On the Up Path. Is a Turn Coming? 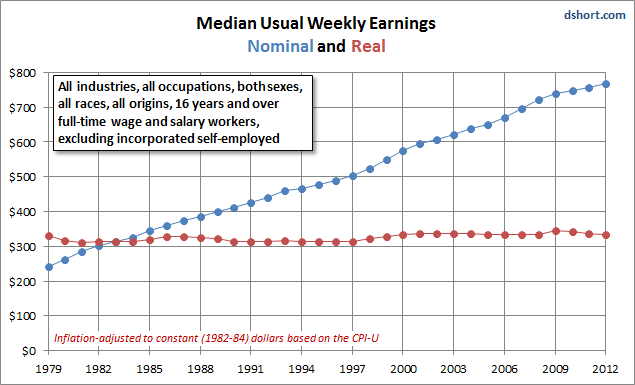 This FRED graph shows the evolution of two sources of income in our national economy: the compensation of employees through wages and other salary compensation, and the compensation of capital through profits. Both series are adjusted for inflation and both start at the level of 100 in 1954, which is the first year that�s considered �post-war� for economic purposes. (NOTE: The economic impact of the Korean War has essentially vanished.) Eyeballing the data leads to two major conclusions. 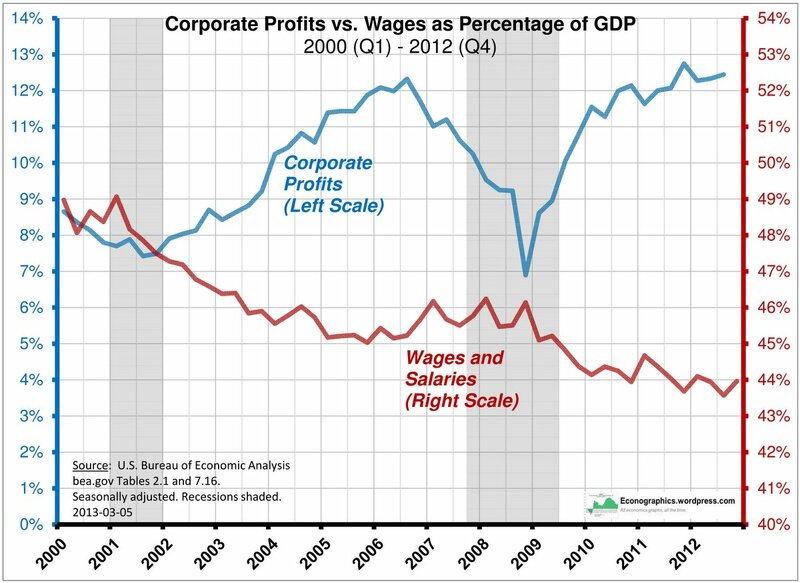 First, corporate profits move a lot, especially in response to general business activity. Profits tend to tank during recessions (noted with gray bars), which is understandable. After all, it�s well understood that investing in a business is a risky undertaking that deserves and often acquires compensation. Employee income is much more stable, but still suffers during recessions. Second, the trends of the two series tend to track each other over several decades, reflecting the general growth of the economy. The past decade and a half seems to be different, though. 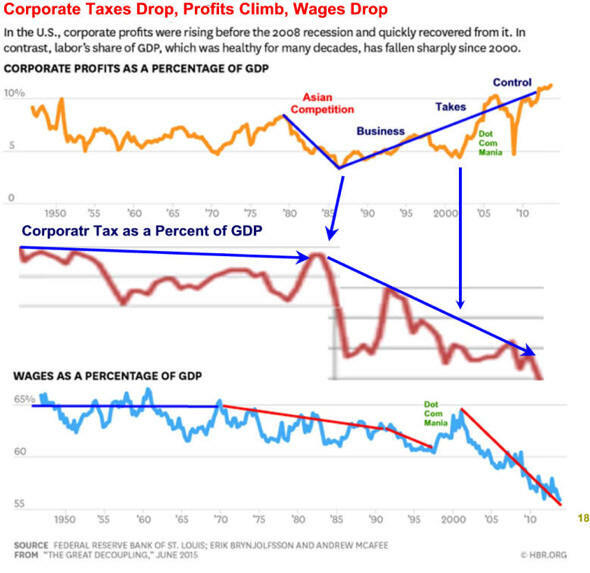 Never have corporate profits outgrown employee compensation so clearly and for so long. Is it because there�s been a particularly risky climate for investment, or is something else afoot? 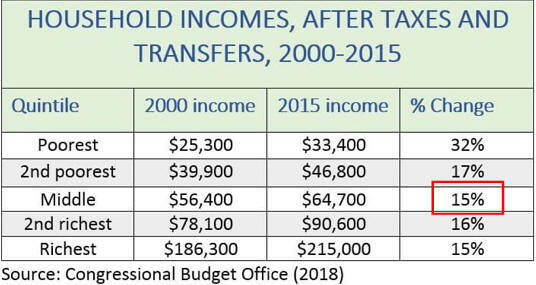 How this graph was created: From the release table about national income by type of income, check the two series and click on �Add to Graph. � From the �Edit Graph� panel, add a series by searching for and selecting �GDP deflator,� apply formula a/b, and finally set the index value of 100 to 1954-05. Repeat for the second line. Table 1 confirms the conventional view that, broadly measured, American living standards are comparable to those of the richest Western European nations but much higher than living standards in emerging-market economies. For example, this calculation puts economic welfare in the United Kingdom at 97 percent of U.S. levels, but estimates Mexican well-being at 22 percent. 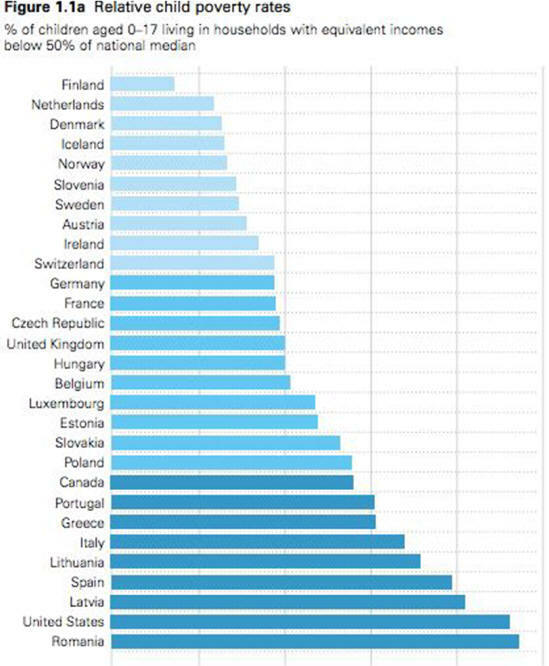 Interestingly, this comparison shows Western European countries (like the U.K., France, and Italy) as considerably closer to the U.S., in terms of economic welfare, than differences in per capita income or consumption would suggest, reflecting the fact that Western European countries do relatively well on the other criteria considered (leisure, life expectancy, inequality). For emerging and developing economies, however, differences in income or consumption per person generally understate the advantage of the United States, according to this measure, largely due to the greater levels of inequality and lower life expectancies in those countries. 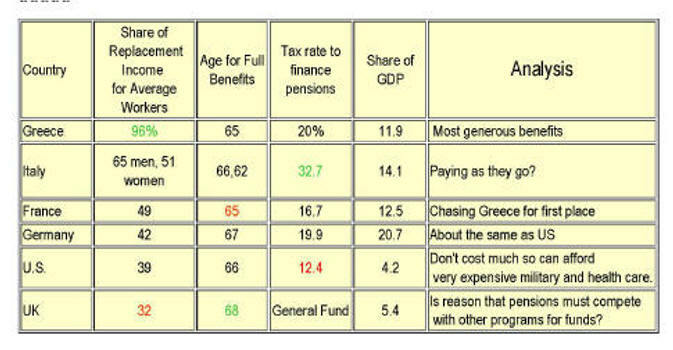 Table 2 shows that economic welfare improved at quite a rapid pace over the two decades before the crisis (1995-2007), at more than 3 percent per year, notably faster than the growth rate of per capita GDP, at about 2 percent. 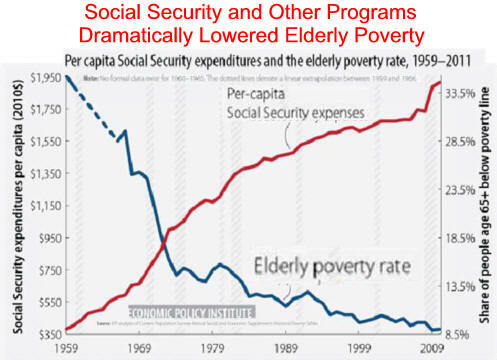 As shown by the four rightmost columns of Table 2 and, graphically, in Figure 1, the gains in welfare were driven primarily by increases in per capita consumption and by improvements in life expectancy, which rose by 2.3 years over the period, from 75.8 to 78.1 years. Rising consumption inequality subtracted between 0.1 and 0.2 percentage points from the annualized growth rate in welfare during the pre-crisis period, and changes in leisure/work hours per person (which were stable) made only a very small contribution. 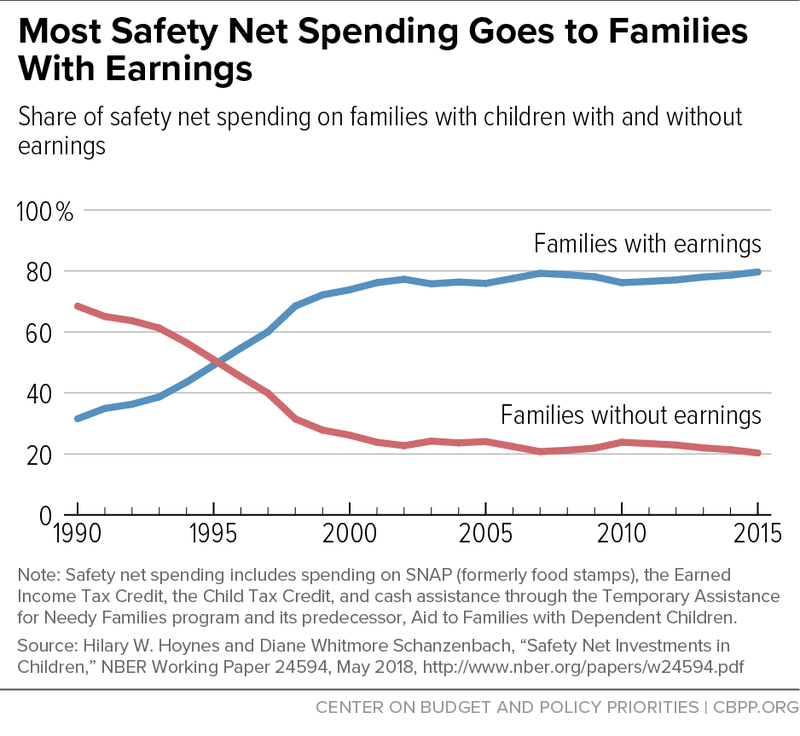 U.S. Safety Net Bigger Than You Think, Who Are They Helping? 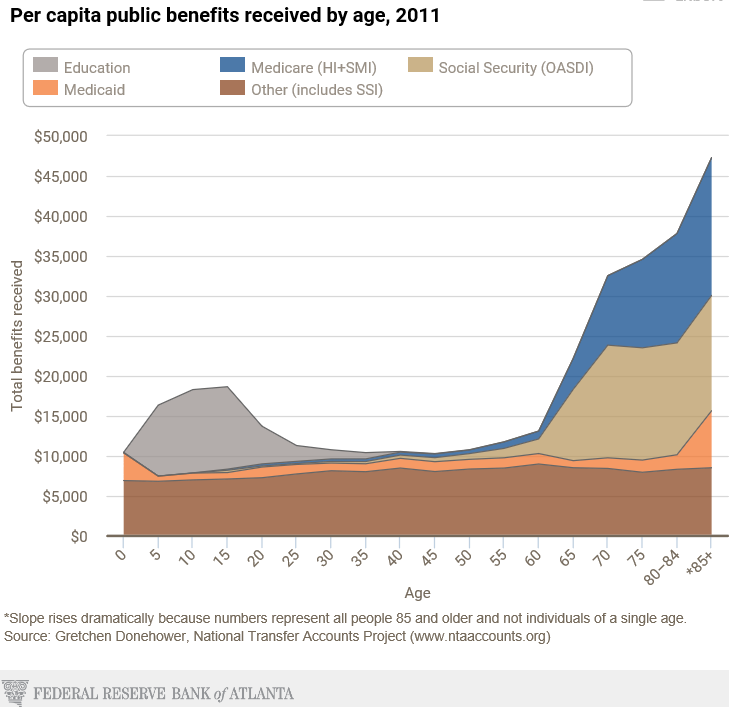 But here�s your trouble: When you combine the distribution of federal benefits and tax expenditures, you find that $32,000 goes to the top 20% versus $24,000 a year to the bottom 20%. 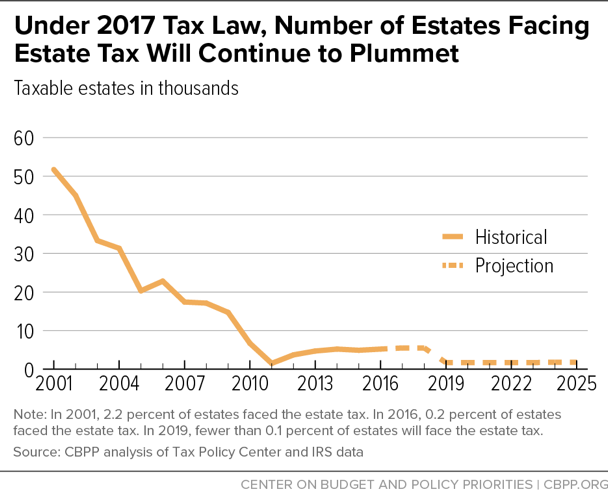 And a big reason for that is that wealthier Americans get a lopsided benefit from tax breaks. 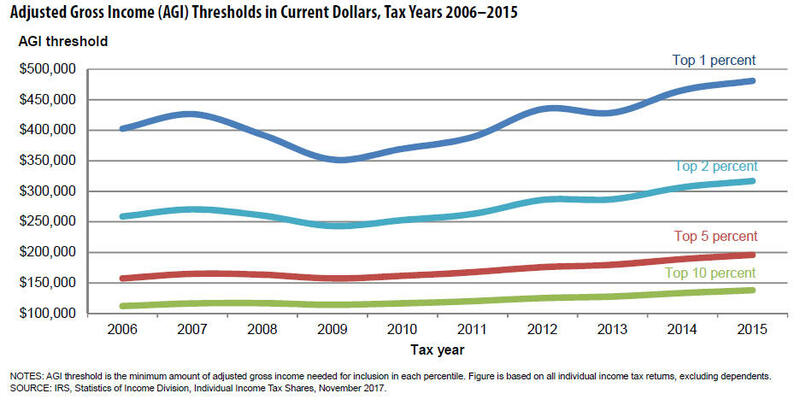 More than half of the combined benefits of the 10 largest tax expenditures go to that top fifth of households, with 17% going to households in the top 1%. 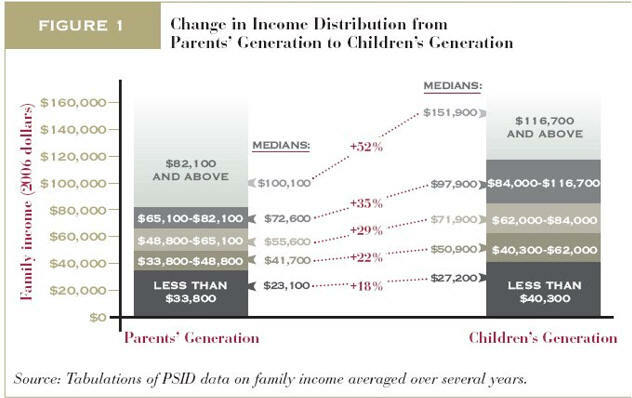 this households declined much more than the family stagnation.